Join us for a Deeper Mind Body Experience on Land and Water! 2018’s edition of the Blue Lake Retreat takes it all to the water. This will be an all skill level experience where beginners can learn the ever important basics of SUP and how to safely paddle your own board on Blue Lake. Paddlers with some experience can work with Head Coach Jeff Briley to refine their SUP skills. 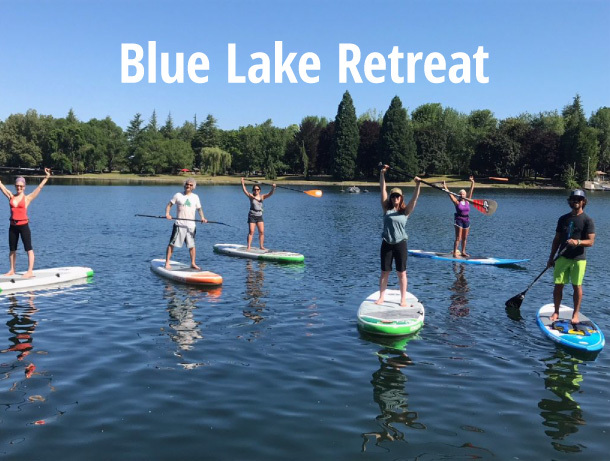 Next we’ll take a leisurely cruise around Blue Lake and then we’ll find our flow with some SUP yoga and meditation with Urban Balance’s Rebecca Schefstrom guiding us along. We will complete this journey with a local, vegan, catered lunch at our exclusive venue overlooking Blue Lake.